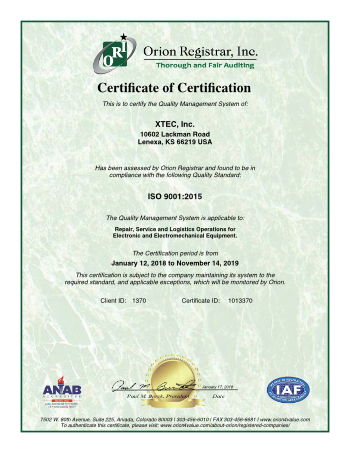 XTEC is an ISO 9001-registered company, and has operated an ISO registered quality management system since 2001. We pride ourselves on being an agile, customer-focused organization that embraces change through continual improvement. For XTEC, this means meeting the evolving needs of our clients by measuring and updating the way we work, our business processes, our supplier management practices, and the safety of our work environment on a continual basis. XTEC is committed to providing our clients with the highest quality reverse supply chain services available. This is not a challenge we set for ourselves simply to be acknowledged as “the best”. We strive to be the best because our customers depend upon the quality of the products and services we provide. Ensure our personnel have the training, knowledge and skills necessary to give XTEC and our clients a competitive advantage in the marketplace.